Never Pay the Full Retail Price Again! Crazy Price Carpets have thousands of happy customers in Cleveland and the surrounding area of Teesside. We are a family-run business benefitting from over 18 years of experience in the carpet industry. Crazy Price Carpets - professional carpet fitters, supply and fit high quality carpets and laminate flooring to homes and businesses in Redcar and the surrounding areas. Welcome to Crazy Price Carpets! We are leading suppliers of carpets, vinyls and laminate flooring to the public, landlords and commercial clients in the region. Sourcing our products direct from leading suppliers enables us to offer beautiful carpets and floor coverings at crazy prices! Crazy Price Carpets is quickly building an enviable reputation in Cleveland & Redcar for the pure quality of our carpets, rugs, vinyls and laminate flooring, as well as our commitment to our clients. We are leading suppliers for families, job satisfaction and price. We bring our shop to you, allowing you to browse samples at your leisure from the comfort of your favourite armchair and place samples in your room to see how they will look once laid. 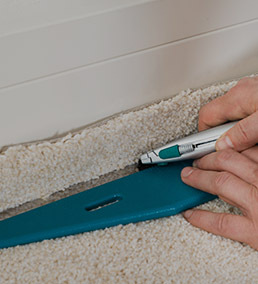 At Crazy Price Carpets we have a friendly, dedicated team of expert carpet fitters who will measure and fit your new carpet for a pocket-friendly rate. No job is too large or small and we take great pride in doing the job right first time. Home and business owners across Cleveland & Redcar are welcome to make enquiries and we will be more than happy to be of service. Our products are available at very competitive rates. If you're searching for inspiration, you can see many examples of the products we offer on the Gallery page. We cover Teeside, Cleveland and a 40 mile radius from Redcar. If you have enquiries about any of our products or services, please get in touch on 01287 651 131 or 07525 822 062. If you would like to rejuvenate any room in your home with a luxury carpet, a hardwearing floor covering or a stunning laminate floor, all you need to do is get in touch with Crazy Price Carpets; we offer free, no obligation quotations with evening appointments available for measuring and fitting.